This is a mandatory “We’ve been quiet for a while now” post. So yeah, we’ve been quiet for a while now. But there’s no creepy hidden bad news behind all of that. Everything is fine at Chainsawesome Games, more than fine actually. 2016 has been a huge year working behind the curtains. We doubled our team, we got a real office space and we started working on a new project. The more we work on our next game ( codename; Pizza Planet ) the more we’re convinced that it will be a very solid game. We have already revealed that Pizza Planet will be an online multiplayer game with 3D art. It won’t be Knight Squad 2, but I assure you it will be worth the wait. We will be lifting the veil on our next game in the first quarter of 2017 and we can hardly wait! 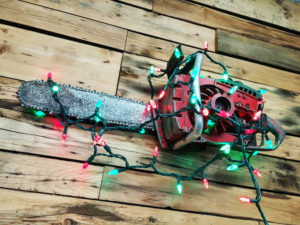 Before we wrap this year up and turn off the chainsaw, we wanted to take a moment to thank our friends, our families and our fans for your support and patience. We hope you’ll spend happy moments and play some awesome games with your loved ones. Merry Christmas and a happy new year to all of you. Be prepared, 2017 is going to be much louder, like a chainsaw’s roar!